Bio-Shirts, developed by Korea's state-backed Electronics and Telecommunications Research Institute, were introduced last week at the National Sports Festival. The shirts are designed to monitor various physiological parameters so elite athletes don't push themselves too hard. Several sprinters tried out the Bio-Shirts. The Bio-Shirt has two parts; a specially designed lightweight shirt and a monitoring system that weighs just 20 grams including the battery. The battery life will be prolonged to cover the average running time of amateur marathon runners - about five hours. "Next year, people wearing Bio-Shirt will be able to know their temperatures, heart rates and speeds while running on a real-time basis using a wristwatch-type miniature computer enabled by Bluetooth," said development team leader Kim Seung-hwan. "When any of the three data types hits a ceiling configured in advance, a warning sign will let marathoners know it is time to stop running and take a rest," Kim said. The shirt can also be used as a non-invasive ambulatory monitoring system for medical patients. "It can feel your heartbeat … look." Sure enough there was a big red spot on the plastic shirt just over her heart, a spot that spread out into an expanding ring that moved on over her shoulders and down to her sleeves. 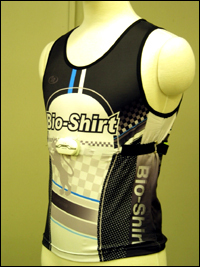 Reference story Athletes to Wear Smart Bio-Shirts via MedGadget.